Georgetown, Guyana – the Caribbean, 23 November 2018: At the invitation of the International Civil Aviation Organisation and the Government of Guyana, the African Union Commissioner for Infrastructure and Energy, H.E. 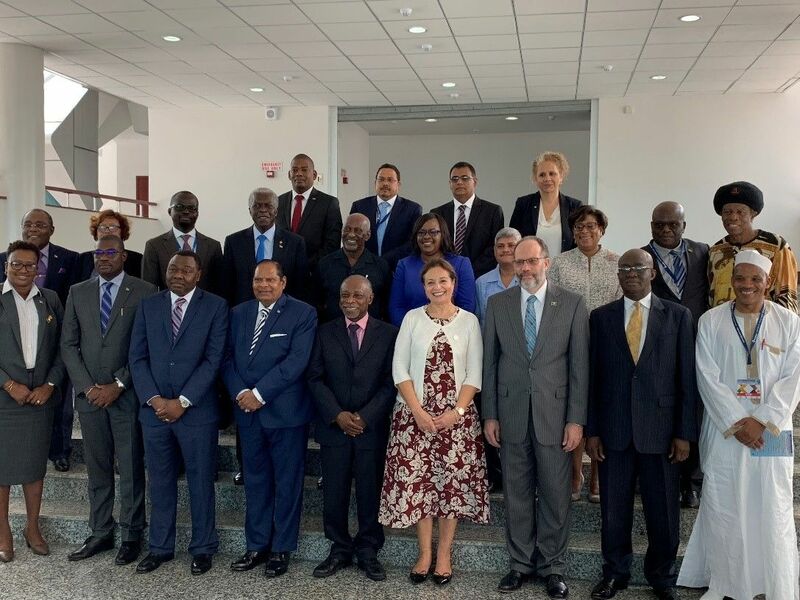 Dr. Amani Abou-Zeid led the AUC delegation to Georgetown, Guyana to deliberate on strategies to promote connectivity between Africa and the Caribbean States, as a means of boosting trade and tourisms between the regions. The Commissioner’s special address during the opening ceremony, attended by the Prime Minister of Guyana – H.E. Moses Nagamotoo and members of Government, the President of the ICAO council – Dr. Olumuyiwa Bernard Aliu, the Secretary General of CARICOM – Amb. Irwin LaRocque and the Minister of Aviation of Ghana - H.E. Joseph Kofi Adda, diplomats and aviation specialists from the Continent and CARICOM region, called for concrete actions towards the implementation of the framework on the Declaration of the Global African Diaspora Summit that was adopted in 2012 in South Africa by the Heads of State of the African Union, Caribbean, Latin and South America governments. Dr. Abou-Zeid noted the importance of aviation infrastructure and in particular air connectivity towards the achievement of aspiration 7 of the AU agenda 2063 of having an integrated continent with world class infrastructure, with a mutually beneficial links with the Diaspora. She further called for the negotiation of an “Open Skies” type air services agreement between the Caribbean Community Market (CARICOM) States and the Regional Economic Communities of Africa. “Tourism is important for both the Caribbean region and Africa”, the Commissioner said and “we need to reflect on how to celebrate and preserve our shared heritage, establish harmonised strategies for the sustainable development of tourism between the African Continent and the CARICOM States and initiate joint cultural heritage festivals across our continents. In this regard, the Commissioner concluded, “I am inviting you to visit the site of the African Union Commission based in Addis Ababa, Ethiopia”. In his opening remarks, Dr. Olumuyiwa Benard Aliu, President of the ICAO Council highlighted that "one of the greatest benefits of aviation is linking people, places and cultures, and our continuous efforts to promote air links between the African States and the Diaspora that will eventually result in some significant socio-economic benefits for both regions." “Guyana and the rest of the Caribbean look forward with renewed confidence at the expansion of links with non-traditional markets, such as with the African Union. Africa and the Caribbean are joined by the Atlantic crossing; and by history, and culture and it is long overdue that we should have air transport connectivity,” Prime Minister of Guyana H.E. Moses Nagamootoon stressed. Following the opening ceremony, the Commissioner held several high level bilateral meetings with the Minister of Energy of Guyana, Minister of Infrastructure, the Secretarial General of CARICOM and Ministers of Aviation of Nigeria and Ghana. The meetings focused on areas of cooperation between the region and the continent. The Commissioner also moderated a special session of air transport meeting on promoting air links between Africa Sates and the Diaspora, based on existing frame work of the existing agreement between the African Union and the CARICOM with the objective of developing an outcome document and a framework for plan of action on the establishment of air links, tourism, trade and investment between Africa and the Diaspora in line with the African Union’s “Declaration of the Global African Diaspora” Summit. The CARICOM stands for the Caribbean Community Market, an organisation of twenty counties with 15 Member States and five associated Member States. Established in 1973, the main objectives of the organisation are to promote economic integration and cooperation among its members, to ensure that the benefits of integration are equitably shared, and to coordinate foreign policy.